Japan’s H-II Transfer Vehicle 6 (also known as Kounotori 6) is seen here at the Second Spacecraft Test and Assembly Building at Tanegashima Space Center. The freighter is scheduled to launch on Dec. 9, 2016. A Japanese cargo vessel will launch toward the International Space Station tomorrow morning (Dec. 9), and you can watch the liftoff live. The robotic H-II Transfer Vehicle-6 (HTV-6) is scheduled to launch Friday at 8:26 a.m. EST (1326 GMT; 10:26 p.m. Japan time) from Tanegashima Space Center in southern Japan. You can watch the Japanese space launch live here, courtesy of NASA TV; coverage begins at 8 a.m. EST (1300 GMT). 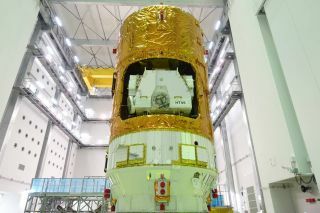 HTV-6 — also known as Kounotori 6, from the Japanese for "white stork" — is loaded up with more than 4.5 tons of water, spare parts, gear for science experiments and other supplies, NASA officials said. If all goes according to plan, the freighter will arrive at the ISS on Tuesday (Dec. 13), when astronauts will grapple HTV-6 using the orbiting lab's huge robotic arm. ISS cargo missions don't always go according to plan. Just last week, for example, Russia's uncrewed Progress 65 vessel suffered a major failure shortly after launch and fell back to Earth, resulting in the loss of more than 2.5 tons (2.3 metric tons) of cargo. As its name suggests, Kounotori 6 will be the sixth HTV mission to launch toward the ISS. The previous five were all successful.